Authors: A. Rassat, J. -L. Starck , P. Paykari et al. 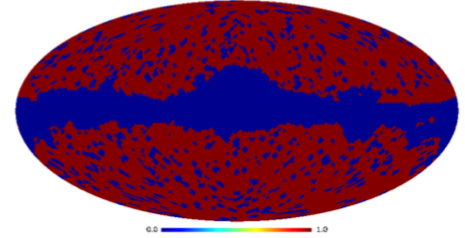 Large-scale anomalies have been reported in CMB data with both WMAP and Planck data. These could be due to foreground residuals and or systematic effects, though their confirmation with Planck data suggests they are not due to a problem in the WMAP or Planck pipelines. If these anomalies are in fact primordial, then understanding their origin is fundamental to either validate the standard model of cosmology or to explore new physics. We investigate three other possible issues: 1) the trade-off between minimising systematics due to foreground contamination (with a conservative mask) and minimising systematics due to masking, 2) astrophysical secondary effects (the kinetic Doppler quadrupole and kinetic Sunyaev-Zel'dovich effect), and 3) secondary cosmological signals (the integrated Sachs-Wolfe effect). We address the masking issue by considering new procedures that use both WMAP and Planck to produce higher quality full-sky maps using the sparsity methodology (LGMCA maps). We show the impact of masking is dominant over that of residual foregrounds, and the LGMCA full-sky maps can be used without further processing to study anomalies. We consider four official Planck PR1 and two LGMCA CMB maps. Analysis of the observed CMB maps shows that only the low quadrupole and quadrupole-octopole alignment seem significant, but that the planar octopole, Axis of Evil, mirror parity and cold spot are not significant in nearly all maps considered. After subtraction of astrophysical and cosmological secondary effects, only the low quadrupole may still be considered anomalous, meaning the significance of only one anomaly is affected by secondary effect subtraction out of six anomalies considered.